Light and dark. The seen and unseen. Theory and reality. The past and the future. During September, programs at the Harry C. Vaughan University of Wyoming Planetarium include an air of dichotomy. “This month at the UW Planetarium is all about opposites; not only here on Earth, but in the entirety of our universe,” says Samantha Ogden, the planetarium’s coordinator. Friday shows start at 8 p.m. during September with a laser light show or a STAR Observatory tour scheduled to follow approximately an hour later. Kid-themed shows are scheduled Saturdays at 11 a.m. Tickets cost $3 for students and $4 for non-students, and can be purchased at the Department of Physics and Astronomy main office, located in Room 204 of the Physical Sciences Building, Monday through Thursday, from 8 a.m.-5 p.m. and Friday from 8 a.m.-noon. Doors open 20 minutes before each show, where tickets will be sold if available. The planetarium, which seats 58, is located in the basement of the Physical Sciences Building. -- “Gravity Waves,” Friday, Sept. 2, 8 p.m. Einstein developed his theory of relativity 100 years ago and, like any good theory, it provided many testable predictions. These predictions included gravity waves, ripples in the curvature of space-time generated when massive objects move. This presentation will provide an overview of gravity waves and their exciting recent experimental confirmation, Ogden says. A Best of Pink Floyd laser light show follows at 9:10 p.m.
-- “From Bang to Bust,” Friday, Sept. 9, 8 p.m. Philosophers have tackled many difficult questions faced by mankind over the course of civilization but, ultimately, the task of answering questions was passed to scientists. Only recently has a picture evolved of how the universe came to be created, how it is now and even how it may end. This program is an introduction to cosmology, which is the study of the universe as a whole. 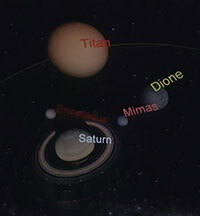 A STAR Observatory tour follows at 9 p.m.
-- “Solar System Giants,” Saturday, Sept. 10, 11 a.m. This show will explore the giant planets of our solar system. From the coldest ice giants to the largest storms and the most breathtaking rings, prepare for a show of massive proportions, Ogden says. After the show, attendees will have a chance to make and decorate their own telescopes to scan the evening skies for gas giants. -- “Water Around the Worlds,” Friday, Sept. 16, 8 p.m. Safely inside the habitable zone of our solar system, the Earth has a perfect environment for liquid water: not too hot and not too cold. And, as astronomers search the galaxy for signs of life, they seek Earth-like planets with perfect conditions for liquid water. However, the Earth is not the only object in our solar system's history to harbor liquid water. Other planets, and even moons, in our solar system show signs of water. This program will discover where and why liquid water exists in our solar system, and the potential these worlds of water hold for extraterrestrial life. A STAR Observatory tour follows at 9 p.m.
-- “Greek Mythology,” Friday, Sept. 23, 8 p.m. Since the dawn of man, humans have raised their eyes to the heavens to divine the stars' place in the sky and, therefore, their own place in the universe. The people of ancient Greece greatly influenced the progress of these observations, leaving lore of heroes, villains, gods and men within the stars. See the ancient Greeks’ place in history immortalized in the constellations people observe to this day. A STAR Observatory tour follows at 9 p.m.
-- “Light,” Saturday, Sept. 24, 11 a.m. Light is knowledge. We can't fly everywhere we want to go in space. It's simply too big. So, how do we know what Jupiter looks like or what stars are made of? The answer is through the nature of light. Discover how light works, and see the highly decorated and colorful universe that we inhabit. After the show, attendees can participate in experiments and discover light. -- “Dark: The Movie,” Friday, Sept. 30, 8 p.m. There's something mysterious lurking in our universe. It permeates all of space, holds entire galaxies together and makes up 80 percent of the mass of the universe. Yet, we cannot see it. This is the mystery of dark matter, the biggest astrophysical problem of our time. This full-dome movie will explain and explore the nature of dark matter with real supercomputer simulations created by Alan Duffy from the International Center for Radio Astronomy Research. This program will search for dark matter to unlock the secrets of the unseen universe. A STAR Observatory tour follows at 9 p.m.